Over the time to come – what I call ‘the sandwich years’ – I found myself both grieving for and caring for my beloved mum, supporting my dad, raising my three young daughters, while trying to get my career back on track. The cracks began to show. I discovered that, sometimes, having it all, means doing it all and that, amid the maelstrom of need, I had lost the label I had started out with: me. 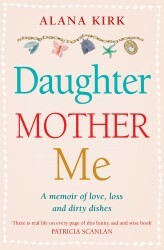 DAUGHTER, MOTHER, ME is the, at times heart-breaking, but ultimately inspirational story of the bond between a mother and a daughter and how one woman who, through caring for the person she had relied on the most, finally found herself.